"The Announcement" examines that day more than 20 years ago when the sports star shocked the world with his revelation that he had contracted the virus which causes AIDS. The ESPN documentary is set to air Sunday at 9 p.m., and its director Nelson George said Johnson had been approached over the years to tell his story, but had been reluctant. "While he does a lot of speaking about this - and has done so persistently - to really sit down and do a lengthy interview about it and have his wife talk about it, that's something they've avoided," George said. "We are very fortunate and quite honored that they agreed to do it at this time." George and the documentary's producer, Rudy Crew, spoke with CNN at the SXSW festival about the project, which they said reveals for the first time Johnson's private struggles in the face of a very public diagnosis. "It's an event that everybody shared in, but clearly this was one that was dealt with by him and his family," Crew said. "It was kind of like how Magic was on the court. He was a showman for everybody, but this announcement clearly was different." The film is narrated by Johnson, which director George said offers viewers "the point of view [of] him looking out at the world." "It's not so much what people said about him, it's how he felt and what people did to him," George said. "Be it people dis-inviting him to their restaurant or dealing with how [the drug] AZT affected his body. It's an inside-out view as opposed to the things you might have heard discussed on talk radio." The project marks a continued delving into the world of docs for George, whose examination of the African American arts movement in Brooklyn in the '80s and '90s, "Brooklyn Boheme," is set to be offered on iTunes on March 13. George said Johnson is hoping to further shine a spotlight on HIV and AIDS. "One of the focuses for him is young people," George said. "The AIDS infection rate for young people, especially among black people, is really bad. He also talks a lot about the idea of drug research. I think there are a couple of agendas for him that are very very powerful." Lose cheek fat today. Are you tired of chubby cheeks Or are you tired of just having extra fat everyone on your body including your cheeks? Hi there! I just want to offer you a huge thumbs up for the great information you've got right here on this post. I will be returning to your web site for more soon. I truly love your blog.. Pleasant colors & theme. Did you develop this site yourself? Please reply back as I’m attempting to create my own personal blog and want to know where you got this from or just what the theme is named. Appreciate it! Thanks for the good writeup. It in truth was once a amusement account it. Look advanced to more delivered agreeable from you! However, how can we be in contact? It write generally seems to have a large number of company. Can you advertise it? The program provides pleasing unusual distort concerning ideas. I suppose enjoying a specific thing absolute or possibly massive to buy facts about is an essential aspect. Johsnon didn't Aids but HIV. He ball but quit HIV cause retire. In 20 years HIV kills not him. But no AIDS lives HIV doesn't kill. Money saved AIDS from him. He very lucky alive to be. Wife is not HIV neither cheating. Regardless cant 20 years. Maybe having someone like Johnson telling his story will teach some of you a lesson is respect and kindness towards your fellow man. But, somehow I doubt it. 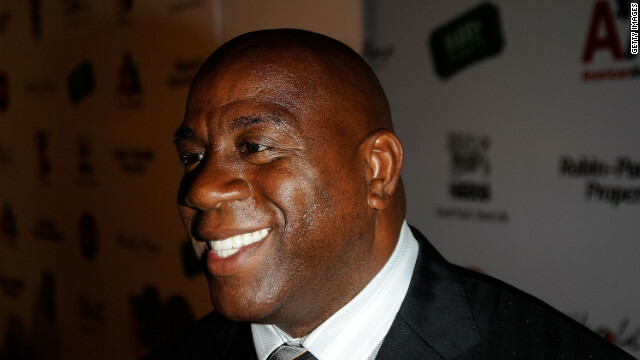 LOL All I saw was a headline link "Magic Johnson and the Announcement"... for some reason, I thought he was gonna come out of retirement and back onto the paint. TC For your info: On 7 November 1991, two months after getting married and still very much at the top of his game, Johnson announced that he had tested positive for HIV and would immediately retire from basketball. He was married and I'm sure engaged when he was cheating. Actually, the blood test that found the HIV had to do with his recently getting married. I believe it was a insurance issue. He was likely HIV positive long before that and just never knew. I am no fan of his, but the timeline does not point to any form of infidelity. I think he was just sucking a lot of d ick before he met his wife and got married. He may assume that peope stopped inviting him to restaurants because he was HIV Pos. It could also have been that people didn't respect his lifestyle of screwing anything he could hold down. And for the record, this is not news. My take is Magic got it from messing around with DownLow Ballers. He did NOT get AZT. He got a BIG favor from a higer up who he tried to pay bay that favor in 2008... He got EXCLUSIVE Drug access for it's time. That is why he still lives for 20 years. AZT was a killer and Magic NEVER showed ANY signs he had lost weight or anything for 20 years. Give me a break. I aint hating on him.. Just that the special treatment he got could have saved a lot of good folks too. Big Choc has never come clean on how he got it. Some folks believe he's a little to touchy feely with Isaih Thomas.. and maybe he had some brothers on the down lo that gave it to him with choco highway action. Hall of Fame players Isiah Thomas and Magic Johnson famously kissed each other's cheek moments before tip-off of Game 1 of the 1988 NBA Finals. In the book, Johnson says, among other things, that he played a role in keeping Thomas off the 1992 U.S. Olympic team. Majic look like one of those chocolate cakes you get at the diner where the frosting is real thick and sweaty looking chocolate. Either HIV was engineered by humans or aliens... They ever figure out what caused that red rain with blood cells in that other country? The virus is just so complex to me, it's like it had to be engineered...... I saw a video on youtube that details what goes on....... Some video some people that study that stuff look at. My god...even at his age...even with HIV...that team would demolish everything it came across. Gotta wonder how Eazy-E died so fast from aids.... I think it's a conspiracy and I'm not the only one. Macaroni and cheese and hot sauce time. Easy E was a rapper not an athlete. Therefore, he probably did not get regular physicals as Magic did. Magic probably found out within months of contracting it, while easy probably went years without treatment or being diagnosed. This is why Easy died so fast. Ps. Easy did not have the finanical resources that Magic did either. It's because he was black..
Can't be nice and respectful? Don't comment. No matter what he did to get the disease, remember that none of us are prefect. But your English is prefect. Let's see what's in the news today...says here "Magic Johnson is down to one AID"
Cindy crawford? No I look alots better than her. And yet I bet her English is much better then yours. And u look like sh-t. Jellybean, a short round fat leave grit in teeth pos. daaayuuum! gawd is he ugly. I was diagnosed with it when george w bush was in office. Its the new aids-Always In Debt Syndrom. What a story....what a story. Behind every good man is a good woman. God Bless the Johnson Family for sharing their story. God is using him (Magic) to encourage others living with this virus that there is hope if you live the way you are suppose to live. PEOPLE, GET TESTED!!! "God is using him (Magic) to encourage others living with this virus"
Don't you think he would have been better off if god had not given it to him in the first place? @derp: God did not give Magic the disease. Magic made his own choices for himself and contracted the diseasel as a result of those choices. Completely his own doing. God doesn't infect people or afflict people with diseases. When talking about God and how screwed up our world is, you have to understand one thing; this is a natural world and natural things are going to happen in a natural world and too many people, like you, want to take every chance they can to blame God when it wasn't God that did it. And the answer to your next inevitable question, "Why does God let bad things happen then?" See the above answer. He is all powerful, and He is still in the miracle making business, but every time God ever healed anybody, it was because of their own faith that they were healed. It wasn't because God was awesome or was showing off, it was because that that person knew beyond a shadow of a doubt that God could heal them. That's why anytime Jesus healed someone, He always told them that their faith has made them whole. @derp: God did not give Magic the disease. Magic made his own choices for himself and contracted the disease as a result of those choices. Completely his own doing. God doesn't infect people or afflict people with diseases. When talking about God and how screwed up our world is, you have to understand one thing; this is a natural world and natural things are going to happen in a natural world and too many people, like you, want to take every chance they can to blame God when it wasn't God that did it. And the answer to your next inevitable question, "Why does God let bad things happen then?" See the above answer. He is all powerful, and He is still in the miracle making business, but every time God ever healed anybody, it was because of their own faith that they were healed. It wasn't because God was awesome or was showing off, it was because that that person knew beyond a shadow of a doubt that God could heal them. That's why anytime Jesus healed someone, He always told them that their faith has made them whole. Can anyone pls tell me what SXSW stands for? Manic Johnson is a great person and has dealt with this situation incredibly. I have a lot of respect for him. "Manic" Johnson? Hilarious. Unintentional, but hilarious. It's all about the benjamins, he's got it, we don't....Next thing you know, they'll want to make his "announcement" a national holiday....just like MLK .....All he was, was a womanizer and a cheater and he deserved what he got...sounds mean, but it's the truth....according to statistics and life expectancy for AIDS carriers, he should have been dead by now if not close to it. The announcement, my a- – -!!! @Panthro - actually the life expectancy for those with HIV is much, much higher than it was when he originally made the announcement. HIV is no longer a death sentence but rather a chronic condition and the medication is now one pill once a day with little side effects. You can have HIV and live a normal, long life. I really wish Americans would start READING and doing the research for themselves instead of relying on outdated information or rumors from other uneducated morons. Great guy, he got infected cheating on his wife. He doesn't talk about that part. He didn't catch HIV cheating on his wife....they were not even married....he found out a few months after they got married and they were not together for 5 years after she broke off their engagment the first time. And on you for missing the point. This "something" that happened 20 yrs ago is still considered a stigma for many and in most parts of this world, HIV/AIDS is a death sentence. That this courageous man would step forward to share his story about living with such a dreaded disease is a true testament to his character. BTW...bet you can't go left!